Posted on August 19, 2014 at 12:10 pm. August brings bountiful garden goodness and the fullness of living and learning at Yasodhara Ashram. Teachers and students from around the world join together, with many serving through Karma Yoga while others train or recertify as teachers. We are also envisioning our inner temple and preparing for a new manifestation of the Temple of Light. Individually and collectively, we grow through experience. The lines between student and teacher disappear and we recognize each other as spiritual companions on the path. We ask: What do we need to learn, what do we already know and what can we share? Together we renew and serve, then offer back our bounty to nourish the world. In this course, you ask yourself the question, “Who am I?” By exploring who you really are, you can peel away external layers and come closer to your essence. Pause, rest and find balance as daylight shortens and we shift into fall. In this retreat, you will focus on going inward, stilling the mind and body, connecting to your inner source of peace, harmony and joy. Learn various practices – including visualization, breathing techniques, concentration and reflection – to help you understand different levels of mind and to approach the mind’s expansive potential. The natural beauty and silence of the Ashram support your search for this silence and beauty within. How do you maintain the ideals of yoga in your daily life, in your family, in your work, in your community? What would it mean to accept the challenge to change, open your heart and mind, and live life fully? This special five-day yoga workshop is led by Swami Radhananda, author and spiritual director of Yasodhara Ashram. Swami Radhananda will help you explore how a life infused with practice and self-inquiry can become a life of meaning and potential. 10 Days of Yoga: One of our most popular programs for students of all levels, this course offers practices that support your personal and spiritual development. Instruction is given in traditional yogic practices such as Mantra, Kundalini and Karma Yoga, combined with original courses Swami Radha created. 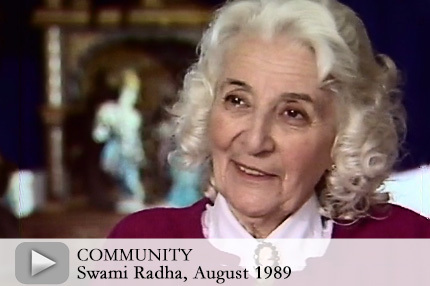 In this video, August 1989, Swami Radha talks about the Ashram, Community and Karma Yoga. She touches on spiritual practices that hold the community together. In late July we gathered to express our gratitude to the original Temple and to say goodbye in a ceremony of offering back flowers grown in its gardens, remembering silently our experiences and then sharing together in small groups what the Temple meant to us. Now, with the Temple down to its original platform, we look to the future. As our 11 video updates since last month’s newsletter showed, fire damage necessitated deconstruction down to the floor, with just the entry area and the prayer room remaining. The process of deconstruction contracted to a Creston company took about two weeks and cost $50,000. All windows and doors – unharmed by the fire – are now in storage, as are the chandeliers that will be assessed for re-use. Working with Yasodhara managers, the contractors saved and recycled as much material as possible. Four thousand time-lapse photographs capture the seven days of Temple deconstruction in magnificent form. Click here to watch the time-lapse video. With the Temple site back to the platform where dance performances and celebrations used to take place, we have the time and space to envision, brainstorm and plan the process of building the new Temple. Staying true to the original essence, people are visualizing, sketching and building models to bring forward innovations. We are looking into new materials, inviting in professionals and imagining the new Light-filled manifestation. We breathe, we learn from the past, we listen for what Divine Mother wants to happen. Please join us, wherever you are, in celebrating our past and the promise of our next steps. Thank you for your heartfelt messages and donations. We will keep in touch about Temple Rebuild ideas and planning as we move forward into the next phases. To make a donation, visit the Temple Rebuild page. 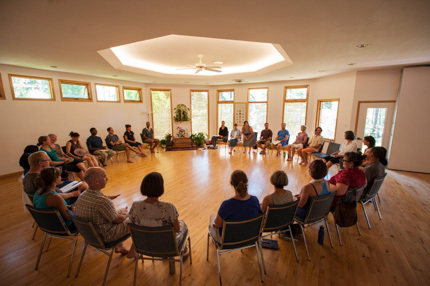 We welcome the opportunity to host groups from all spiritual traditions at Yasodhara Ashram. The essence of the Temple of Divine Light, which was designed with eight doors to represent different pathways to the Light, lives on! Whether in Mandala House or at the beach, the prayer rooms or in the tipi, satsang brings us together nightly with the same “Temple” spirit of community and devotion. And we continue to accommodate the needs of every individual and group that enters. Over the past few months, a Sufi group shared a Circle Dance, the Mishras played a classical sitar concert and an Aboriginal songwriter held a tipi-blessing ceremony. We also hosted numerous guests, including those on artistic and professional retreats, and invited in our neighbours and visitors with Taste of the Ashram. In September Venerable Lama Losang Samten will be returning to offer his second Buddhist Meditation Retreat at Yasodhara Ashram. For more information about how we can meet the needs of your group – large or small – please visit our website or contact registrations. In Yasodhara Yoga we encourage our teachers to clarify their own values. With every teacher certification course, we always pose the question, What are your ethics? Now we want to expand that discussion with other teachers from diverse traditions. What are your values and principles as a yoga teacher? How do you actually live your ethics in your classes? Do the ethics in classes apply to your life outside teaching? How do our modern-day values tie in with an ancient system, such as Patanjali’s Yoga Sutras? Or do they? This weekend course – new to our program offerings – will give you an opportunity to challenge yourself, think deeply, interact with others as well as to study, question and practice together. And please help us spread the word by printing and taking posters to your local yoga studios. For more information, see the program calendar. 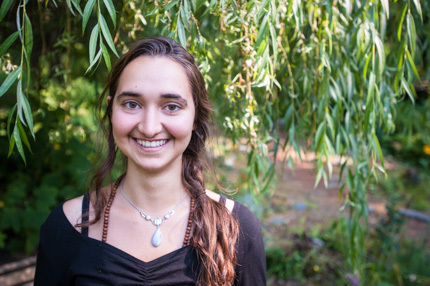 Ametisse Gover-Chamlou’s first Yasodhara Ashram stay at age 18 included the 2013 Yoga Development Course and Karma Yoga. Next step was a year of Liberal Arts at Quest University near Vancouver. She returned to the Ashram for Karma Yoga and a month of teacher training. In September she returns to Quest. The power of experiential learning – Swami Radha’s mainstay – shines forth in the summary written by Ametisse after completing her 30 book reflections required for teacher certification. Push, rest, go, stop, do more, do less, tense, relax, inhale, exhale – walk the line of my limitations. The place between I can and I can’t is the Sacred Ground of Learning. It is a resting ground and a battlefield, a place of both work and reflection. I have grown. My voice grew deeper – more personal, more abstract, more irrational – when I was speaking from my most vulnerable. That’s where I was my most sincere, and that sincerity carried me into unknown places within myself. There are symbols and themes that thread themselves throughout my papers: Mountain, battle, fire, Mother, feminine, breath, birth, water, harmony. As I read over my reflections I see how these themes were given space to mature the more I opened myself to inner and outer intimacy. I see how in giving more of myself to the reflections, the deeper I was able to go. Learning does not happen in shallow ditches. I needed to dig the well and dig it deep. I needed to reach the water in order to drink from it. This was a process of healing – a process of getting real and a process of change. The Sacred Ground of Learning is where healing takes place. Yasodhara Outreach is stepping up to an international learning event at Columbia University, New York. 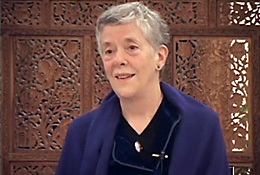 Alicia Pace, Vice-President of Yasodhara Ashram and founder of Yasodhara Institute, will guide a session titled Exploring the Spiritual Space Within at the 11th International Transformative Learning Conference October 24-26. Alicia reflects on this opportunity. I’m thrilled. Swami Radha saw the benefit of connecting the teachings with educational institutions and this is a step in that direction. Alliances like this keep us tapped into what is happening in the world and, in turn, I believe we have a significant contribution to make. Yasodhara practices and our experiential learning focus are all about transformative learning – the expansion of consciousness. In this session, participants will engage in the Straight Walk and literally walk through a series of reflective questions. This opportunity supports the ideals of the Yasodhara Institute, a longer-term idea I am fostering to extend our teachings into professional and synergistic educational partnerships. What I also appreciate is that this idea came forward from two Yasodhara friends who live in New York – Andrea Rollefson, a YDC graduate and photographer, and Christie Rall, a PhD candidate at Columbia University. They opened the door and helped submit the proposal for Yasodhara’s participation. If others in our network have academic and/or professional sessions they would like us to provide, please contact me (alicia@yasodhara.org). Check out our other Outreach offeringstoo. The building that housed Ottawa Radha Yoga Centre for 30 years sold on July 31. 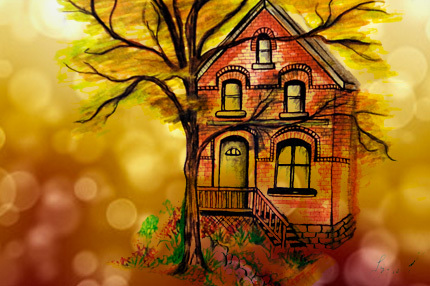 This special 100 year-year-old house provided the sacred space for satsangs, classes, celebrations, management of the Radha Yoga Youth Outreach Program (RYYO) and many workshops with Swami Radha, Swami Radhananda and other Yasodhara swamis. With classes downsizing and local teachers needing more personal time, the house was no longer sustainable. In their farewell celebration, members of the community scattered rose petals from their recent rose ceremony at the four corners of the house, commemorating their own experiences in the space and preparing the ground for the new owners. offer weekly satsangs in her home starting in September and thus continue Yasodhara Yoga Ottawa. “It’s a big transition and we are ready for it,” she says. “We will meet this fall to make future plans. We can learn from how other centres carried the teachings out to diverse communities across the country.” Anne already teaches seniors at a community centre. In Spokane, the original Radha House building on Pacific Ave. recently went on the market (see the listing) as the Yasodhara Yoga Spokane group adjusts to changing needs. Classes will continue at the beautiful studio – a former carriage house – in historic Browne’s Addition on property that includes a 100-year-old apartment house and the Timeless Books depot. Nina Mirachi celebrated her 27th birthday in May and recognized something was missing in her life. She decided to return to Yasodhara’s Young Adult Program (YAP). Her supervisor suggested she take two weeks; Nina insisted on one month. “I wanted the support and also the process that is in place here and that has helped me so much in the past.” As part of YAP, Nina participates in full-time Karma Yoga, a weekly evening class, a Saturday afternoon workshop, morning Hatha Yoga and evening satsang. Teachers Reconnect: Tara Naraynsingh journeyed to the Ashram from her homeland of Trinidad for her annual month of inspiration and service this summer. Other teachers joining us for longer visits included Arlene Trustham of Courtenay, Shanti (Dorlean Peck) of Nanaimo, Anne Churchill of Ottawa and Victoria Campbell of Toronto. They will be back in their communities teaching this fall. Check here to find a Yasodhara teacher near you. YDC Paths:Graduates of the 2014 Yoga Development Course who stayed on for five months of Karma Yoga are either leaving this month or extending their stays. “It is time for me to cast Light on my life at home,” says Mie Larsen who is returning to Denmark. “My only and most important plan is to continue my practice and teach yoga.” Lindsey Curtis of Vancouver reflects about extending her Ashram stay for one year: “My time here has just begun. Staying feels right, exciting. Being supported in a community and helping the Ashram function is the most fulfilling life situation I’ve ever found myself in.” Consider joining the 2015 YDCfrom January 8 to April 8 for an in-depth focus on your personal and spiritual development. What will your 108 be? Start imagining how you can join the Yasodhara 108 fundraiser this fall. You can offer 108 of any practice that helps you connect spiritually: collage, mantra, baking and photography are examples from last year. Funds raised support the Young Adult Program (18-30). Be part of this vibrant community action that you can do anywhere. We’ll provide sign-up details shortly. 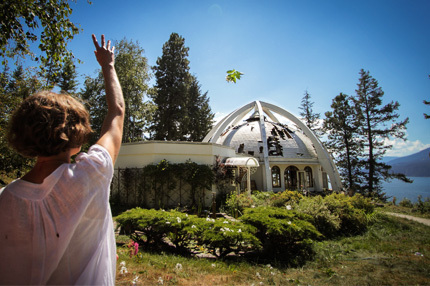 August Celebration: Themes of gratitude and the inner temple wove themselves throughout the August celebration weekend at Yasodhara Ashram. A garden party at Many Mansions – with shade enhanced by saris pinned from the trees – brought residents and guests together to honour our community and lineage. See our photo gallery on Facebook. 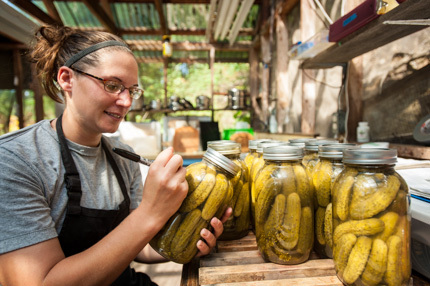 Garden Flourishes: The Ashram garden and orchard are providing fresh produce for meals and preserving, as well as meaningful Karma Yoga activity. The prolific garlic harvest“was just beautiful,” commented garden intern Bryn Bamber. 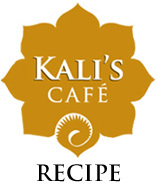 See Kali’s Café for the fruits of our raspberry crop. Kootenay Spirit Festival: Join the Ashram at the first-ever Kootenay Spirit Festival in Nelson, September 12-14. It’s an ideal location to celebrate mindful living, love of nature and engaged community. We are pleased to provide two workshops on Saturday, Sept. 11: Hidden Language Hatha (10-11:30 am) and Sacred Dance (1-2:30 pm). Check kootenayspiritfestival.ca for more information. From a Temple Satsang in April 2007, Swami Radhananda speaks about community, and living in harmony, using the metaphor of a flowing creek. In this audio excerpt, Swami Radha speaks of levels of mind and consciousness – an internal community – and offers help and encouragement as we continue on our individual paths of evolution. Reflection QuestionsThe theme for August is “Community.” This month’s theme was generated by a small group of teachers who joined the Ashram community for the summer to offer their wisdom and experience through Karma Yoga – whether teaching, organizing, cleaning or preserving cherries. We invite you to reflect on what “community” means to you – and come to the Ashram any time! 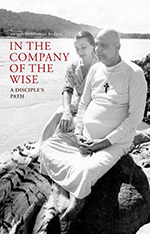 “If we refer to the four twenty-five year stages of asrama, the first two are given to learning and duty (family, children), the third is learning under the guidance of a guru, and the fourth stage is to become a guru.” (Kundalini Yoga for the West, page 75).The Bhagavad Gita says that one could be born into a family of yogis. Into what circumstances do you want to be reborn? What can you give birth to in your community in this lifetime? “The Triangle posture emphasizes the three parts in the interplay of forces: dependency, interdependency and interaction…. Think of the trinities within yourself: physical body, emotional body and mental body. 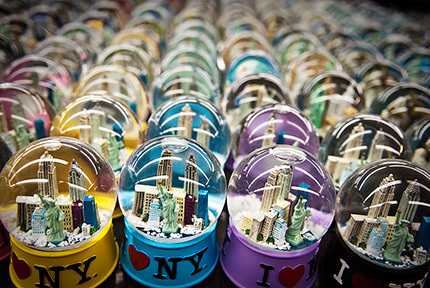 Think of the physical world, mental world, celestial world. How are they related to each other? (Hatha Yoga: The Hidden Language, pages 79 and 83). “All community work requires personal work. And all of our inner work requires patience. If we want to have a healthy community, we have to start by making an honest commitment and showing respect for the place we are in personally.” Sit quietly for a few minutes, or chant or do a hatha pose and allow your mind to relax. “Ask yourself: What kind of person do I want to be? What are my ideals? How am I interacting with others – am I being straight? By taking time each day to check in with yourself, you build the trust and strength to address what will arise with others.” (Living the Practice, page 178). ” If we train the mind to understand and be receptive to the Light and what it really means – not only on an intellectual level, but on a personal level – we create positive vibrations. Ask: How was I created by Divine Light? How can I rediscover this Light in myself? What can I do to discover Light in others?” (Light and Vibration, page 153).